There is no evidence of any terrorist activities in Crimea, yet Ukrainian filmmaker Oleg Sentsov and 3 other opponents of annexation are serving huge sentences for supposed terrorism, and the number of such convictions is likely to increase with the trial this week of four Crimean Muslims and an ever-increasing number of new arrests. Nuri Primov; Rustem Vaitov; Ferat Saifullayev and Ruslan Zeitullayev have all been in custody, accused of organization or membership of a ‘terrorist organization’ for well over a year. 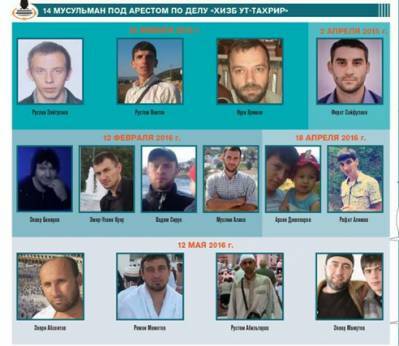 Their trial, beginning in Rostov on June 1, will be closely followed since Russia’s FSB in occupied Crimea has this year already arrested 10 other men on identical charges. The term ‘trial’, however, is used very loosely, since convictions are almost certainly predetermined. Ruslan Zeitullayev has been dubbed the ‘organizer’ and could face 15-20 years’ imprisonment, or a life sentence. There were no terrorist acts. There is no evidence of terrorist plans against any of the men. Hizb ut-Tahrir, the organization they are accused of being members of is legal in Ukraine. There is no proof that the men were members. There are grounds for believing that at least some have been arrested and charged due to their civic and / or human rights activities. There is no evidence that Hizb ut-Tahrir has been responsible for even one act of terrorism or violence. 14 men are now in custody and facing charges under Article 205 § 5 of the Russian Criminal Code (organizing / participating in a terrorist organization). The charges in the case of the four men whose trial begins on June 1 are already known. They pertain solely to alleged membership of Hizb ut-Tahrir, and appear to be copied verbatim from the indictment in the case of bulk prosecutions in Bashkiria. The repeated format was to be expected. Within weeks of annexing Crimea, Russia had sent a veteran KGB/FSB man Viktor Palagin to head the FSB in Crimea. He was notorious for his activity in prosecuting and imprisoning en masse alleged Hizb ut-Tahrir members in Bashkiria. Hizb ut-Tahrir is described by the authoritative Chatham House as a pan-Islamist movement which tends “to avoid violent means and instead may focus on social work, education and dialogue initiatives”. Whatever we may think of Hizb ut-Tahrir ideology, the organization is legal in Ukraine, and in most democratic countries. It was however, together with 14 other organizations, declared ‘terrorist’ by Russia’s Supreme Court and banned. That hearing on Feb 14, 2003 was behind closed doors with none of the organizations present. There was no possibility of lodging an appeal since nobody was informed of the decision until it was too late. The renowned Memorial Human Rights Centre points out that the judgement does not provide any information about terrorist activities as per Russia’s Criminal Code and legislation and this “gives clear grounds for declaring the judgement unwarranted”. Memorial HRC has therefore consistently found all those convicted of the same charges as the men in Crimea to be political prisoners since no proof has been provided of any terrorist activities or violence. The Sova Centre in Moscow which monitors xenophobia and the application or abuse of extremism legislation takes a similar stand on charges of terrorism. These, it says, are unwarranted since Hizb ut-Tahrir does not practise violence or advocate it as a method for achieving world Caliphate. Memorial’s Vitaly Ponomaryov has suggested that Hizb ut-Tahrir may have been declared terrorist to make extradition to Uzbekistan easier. The latter was hunting even moderate Muslims as enemies of the notorious Karimov regime, and the collaboration between Uzbek and Russian security services kept attracting unwanted publicity. The recent arrests in Crimea all followed mass searches by armed and masked men who used force to burst into homes where nobody had shown any resistance. Children awoke to find men with machine guns in their home and their fathers being taken away. There have been appalling infringements of the men’s rights from the start. Both with the first four men now going on trial, and in other cases, rights lawyer Emil Kurbedinov has been prevented from defending more than one of the accused. The court hearings on extending detention were quite surreal, with attempts to foist summonses on each of the people standing in the corridor wishing to attend the hearing. There was even a police woman openly videoing everybody. There is unrelenting pressure on all 14 men in custody to ‘confess’ and ‘cooperate with the investigators’. FSB officers are also reported to be visiting the families, offering to let them see the men in exchange for such ‘cooperation’. Abdureshit Dzhepparov, Coordinator of the Contact Group on Human Rights in Crimea is convinced that such arrests are an attempt to intimidate Muslims and give other Crimeans the idea that Muslims are a danger. It is doubtless no coincidence that the armed searches and arrests coincided with the final stages of the attack and ultimate banning of the Crimean Tatar Mejlis or representative assembly as ‘extremist’. Dzhepparov calls this a ‘conveyor belt’ which Russia has already tried and tested. It has worked in the Russian Federation with men arrested in large numbers, ‘tried’ and sentenced to long terms of imprisonment with only their names, at most, known. These ‘trials’ never end in acquittals, since Russia allows for the use of anonymous ‘witnesses’ who can, in secret, testify that a defendant tried to ‘recruit’ them. The four men arrested in Russian-occupied Crimea in 2015 were, as feared, only the beginning. 14 men are facing long prison sentences for being practising Muslims and in some cases for being active members of the Crimean Tatar community. These are Ukrainian political prisoners urgently in need of attention. • Crimea is not a closed subject, Putin. It’s an open wound.